Have you ever seen a concept house like this before? Not likely. Designed by the visionary team at Modscape, it pitches itself as a solution for people who own small patches of coastal land in Australia. 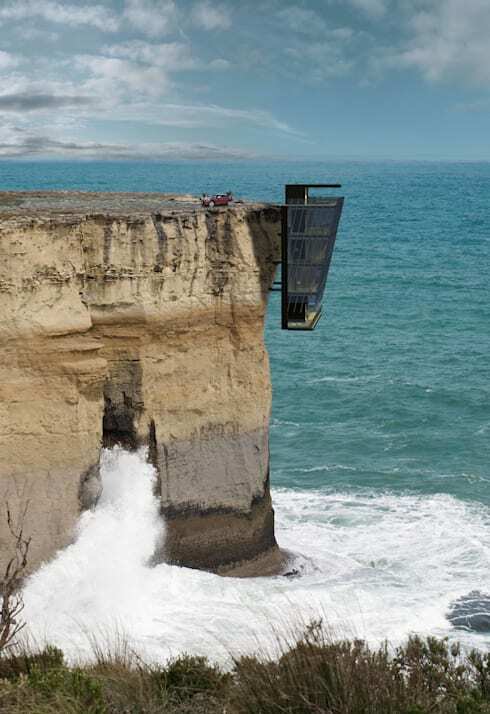 Instead of being built on top of the cliff, this five storey house goes over the edge. It clings to the rocky face like a barnacle on a ship, which is what originally inspired the designer's bold vision. The approach to this home is dramatic enough—imagine driving across this barren, rocky terrain just to get home for dinner! Thankfully, there's no need to leave your car parked on top of the cliff. Entry to the home is via a carport on the top floor, which is capable of comfortably housing two cars. Imagine lounging around in this minimalist living room, watching the ocean stretch out towards infinity. Far beneath your feet, waves are breaking and you know that the only thing between you and the surf crashing on the rocks below are a series of steel girders bored into the rock. You'd need a strong stomach to live here, that's for sure, but the view is totally worth it. Located on the second floor down, this all-white living space features slanted window walls, comfortable sunken sofas and subtle handle-less cabinets that blend seamlessly into the design of the room, allowing clutter to be stored safely out of sight. Each floor of the home adheres to a minimalist aesthetic. 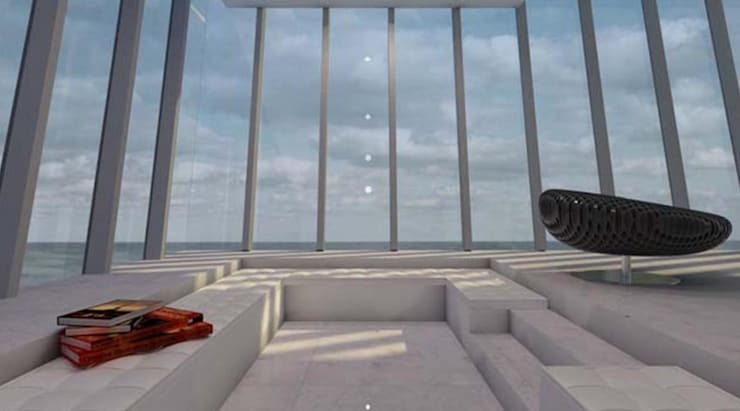 This was a conscious decision on the part of the designers—not because they really hate clutter, but to ensure that the ocean views, connection to nature and unique spacial experience of the location were not eclipsed by flashy design. By choosing this interior style Modscape direct the inhabitant's gaze outwards, encouraging them to focus on the wider world and the bigger picture. This blueprint shows us exactly how the team at Modscape believe the home should be laid out. 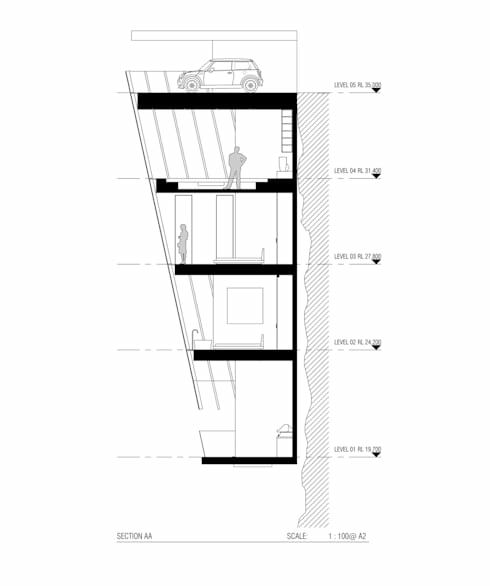 A lift and small staircase run from bottom to top, affording easy access to each floor. Visitors make a leap of faith and step directly from clifftop into the carport, before heading down to the living, dining and kitchen space on the second floor. As the space contracts on the third floor, the room is split into two cosy bedrooms and a small bathroom. A further bedroom and en suite sit on the fourth floor, but the real surprise is at the bottom of the home—a BBQ area and personal spa, complete with a whirlpool! A cross-section of the home reveals how the designers envision their living concept. The house never juts out too far from the cliff face, so space is created by building laterally along the cliff face instead. That being said, the inhabitants of this home are never going to have to worry about not having enough room, and privacy certainly won't be an issue—this home is about as remote and secluded as you can get! If you liked this article, you'll love: The stylish and affordable Johannesburg home. 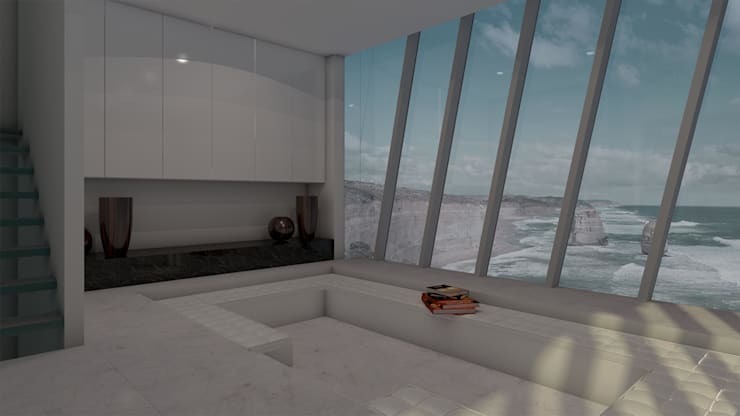 Could you live in a home that hangs over the sea? Let us know in the comments below!